"Dividual Plays Experimental Lab" is an extract from the dance piece Dividual Plays. Dividual Plays was produced as the first research outcome of Reactor for Awareness in Motion (RAM), a research project we have been involved in since 2010. 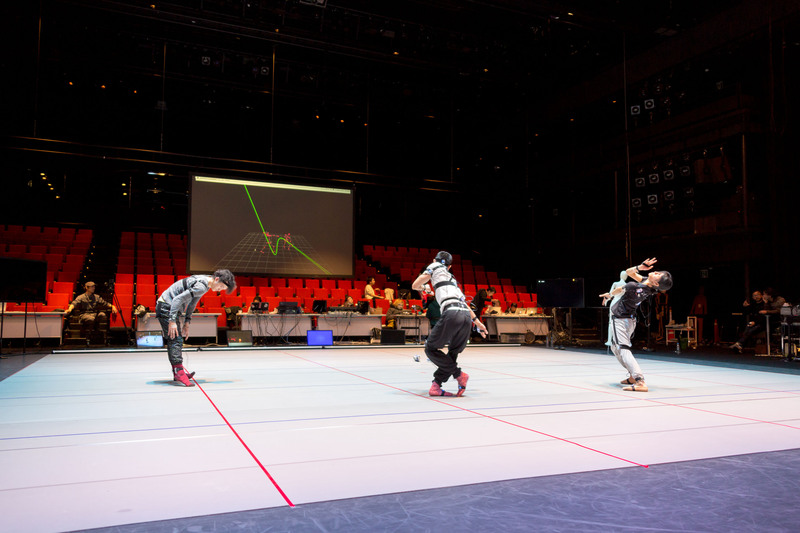 "Dividual Plays Experimental Lab" consists of essential elements of Dividual Plays: virtual environments for dance "scenes," a programming toolkit (RAM Dance Toolkit), and a motion-capture system (MOTIONER). With these systems, the lab allows the visitors to explore and create their own body movements to correspond with the experience of the dancers in Dividual Plays. Konno, K., Owaki, R., Onishi, Y., Kanda, R., Sheep, Takeshita, A., Nishi, T., Shiomi, N., McDonald, K., Higa, S., Jo, K., Ando, Y., Abe, K., and Ito, T. Dividual Plays Experimental Lab: An installation derived from Dividual Plays. Proc. of the 10th International Conference on Tangible, Embedded, and Embodied Interaction. ACM, New York, 2016. A motion-capture system studies how dancers' movements are shaped when interaction is established between the virtual environment and dancers in the real world.